ATD-Orange County Chapter - BizSIG ~ Leading Innovation – Entry and Contracting! BizSIG ~ Leading Innovation – Entry and Contracting! Have you ever created or delivered a program which, although well received by the intended audience, you had to change or cancel all together because management failed to see the value? Unfortunately, this is an exhausting challenge many of us face in the learning and development field every day. Whether you are an internal practitioner or an external learning consultant, influence within business consulting skills are a critical tool to help you avoid this fatiguing uphill value battle. Learn about influence without authority to get the value and impact of your programs heard. Leverage your power to guide stakeholders to gain alignment in learning plans. 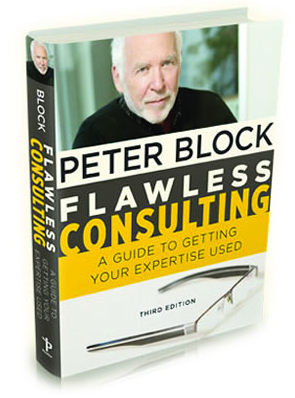 Come to the BizSIG and experience the value to your career from consulting and applying methods from Peter Block’s book Flawless Consulting Flawless: A Guide to Getting Your Expertise Used. This is part of a bigger effort, developing your ability to understand all aspects of an internal (or external) consulting project, leveraging Peter Block’s methodology. Click here to learn more about how this fits in to the larger picture and about other opportunities to come in 2016!